Astronauts Jeff Williams and Kate Rubins floated outside the Quest airlock on the International Space Station at 8:04 a.m. EDT to begin a 6 1/2-hour EVA. 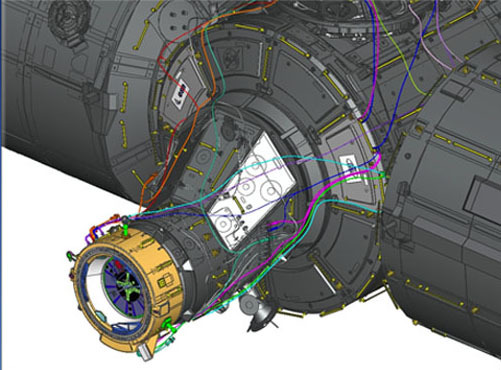 The spacewalkers will connect the International Docking Adapter to the station so that visiting vehicles including those in development for NASA’s Commercial Crew Program can connect to the station in the near future. The IDA itself, built by Boeing, has been pulled from the trunk of a SpaceX Dragon cargo resupply spacecraft and positioned next to the port it will be connected to. The video below shows the IDA’s extraction, and you can watch NASA TV’s spacewalk coverage this morning in the window to the right, on Web streaming or on NASA TV. The coverage will include conversations with spacewalk officers, astronauts and Commercial Crew Program officials. Also, you can tweet questions to astronaut Doug Wheelock – @Astro_Wheels – throughout the morning. Just use #AskNASA.